Pierre Boileau will forever be remembered as half of the Boileau-Narcejac writing team that got translated into English back in the day. Not only that, one of their novels was adapted by the great Alfred Hitchcock into Vertigo! How cool is that? But before Boileau and Narcejac met, they wrote their own stuff… and one of Pierre Boileau’s most famous works is Six crimes sans assassin (literally Six Crimes Without a Murderer, though I believe it was translated as The Phantom Strikes Six Times). 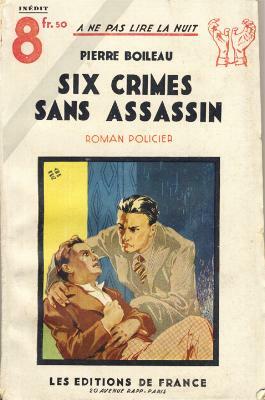 It’s considered a classic of the French roman policier, right up there with the likes of S. A. Steeman’s L’Assassin habite au 21 (The Murderer Lives at No. 21), or, in my humble opinion, Paul Halter’s Le Diable de Dartmoor (The Demon of Dartmoor). (English readers, you really have no idea what treat you’re in for when Halter’s Demon is published in English soon!) And as the title indicates… it involves an impossible crime! And that’s just a warm-up. In the next episode, a corpse appears in a room under observation without explanation. A possible witness, located in Le Mans, is told to lock himself inside a room and not to open the door to anyone but the investigators, no matter what. He agrees to do this: but the next day when the investigators arrive, he is dead from a gunshot wound! All this is masterfully intertwined and explained by Boileau. The solutions are all ingenious, but unfortunately, I’m a blockhead and managed to spoil the solution to the first impossible crime. Because I knew the mechanics of that murder, I was able to deduce the killer, and so I was able to solve the fourth, fifth, and sixth crimes easily. 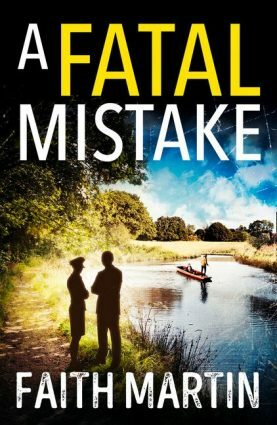 I’m ashamed to admit that I was baffled by the third crime, which had a remarkably simple trick at its core, but several things managed to remain surprises: a nice bit about motive, a good, plausible explanation for why the victim should have done this-and-that, etc. 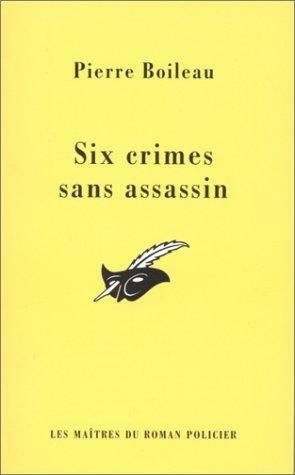 I still enjoyed myself tremendously, especially since the story is told in a frantic pace, with crime after crime occurring so fast that I had no idea when Boileau would stop to take a breath and try to solve these impossibilities! Fans of Golden Age mysteries will be pleased to hear that Boileau’s clueing is scrupulously fair. He never directly lies to the reader, but he does allow you to make false assumptions while parading the truth in front of you. It’s a deft exercise in fair play clueing, though as I said it’s a bit wasted on me due to my stupidity in spoiling the solution for myself. Our detective for the evening is André Brunel, accompanied by his unnamed chronicler. Brunel is a fascinating detective: he has many of the qualities we associate with the traditional GAD detective. He’s eccentric, he likes to think of crime as a game, a mere logic puzzle. But in this outing, reality strikes him a heavy blow. This isn’t a “mere game”—he knew the victims intimately and cannot imagine why someone should organize a mass slaughter around them. He must suffer great emotional pain as Simone Vigueray teeters between life and death, and could easily shuffle off this mortal coil at any given moment. As if that wasn’t enough, he must break the news to Simone’s mother while keeping it from her little daughter Janine. He is confronted with the sheer nastiness of crime, and it humbles him enormously. What makes this so effective is that these passages do not slow the book down; indeed, they are part of what makes this book so fascinating. These aren’t long lectures on how to solve all of society’s problems—these are small, intimate scenes which are made all the more uncomfortable for that. Although I think the book has been translated into English, I can only wish you all good luck in finding a copy. There’s none listed on Bookfinder.com, and a Google search for THE PHANTOM STRIKES SIX TIMES only leads you to several irrelevant listings and a previous post on my blog. It’s a shame: the book definitely deserves reprinting. Here’s hoping it becomes more widely available to English-speaking readers! Note: This book is rated with 4/4 stars in Chambres closes crimes impossibles (Locked Rooms, Impossible Crimes), the French equivalent of Robert Adey’s classic Locked Room Murders, co-written by Philippe Fooz, Michel Soupart, and Vincent Bourgeois. A second edition is apparently in the works, with Roland Lacourbe joining the team! Who published the English language edition, and what year was it? I have looked for this book in vain and even now I have doubts if there ever was an actual English translation of this book, but, apparently, there was and that means I have more work to do. Has anyone seen where I put my deerstalker? Oh, great review, Patrick, you know how much I enjoy impossible crimes and this one will have a spot on my shelves one of the days! I cannot give details about any potential English translation -- I saw one on Bookfinder while searching for this book, and it seemed like a genuine translation, at least if the seller was honest. It's been translated into other languages for sure, but if it's been translated into English it's made a disappearance that would make John Dickson Carr envious!